Nashorn is a runtime environment for programs written in ECMAScript 5.1.
and then use it just as you would any other JSR-223 script engine. See jdk.nashorn.api.scripting package for details. Nashorn is 100% compliant with the ECMA-262 Standard, Edition 5.1. It requires a Java Virtual Machine that implements the JSR-292 "Supporting Dynamically Typed Languages on the Java Platform" specification (often referred to as "invokedynamic"), as well as the already mentioned JSR-223. In addition to being a 100% ECMAScript 5.1 runtime, Nashorn provides features for interoperability of the ECMAScript programs with the Java platform. 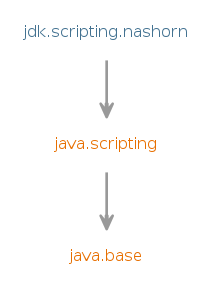 In general, any Java object put into the script engine's context will be visible from the script. In terms of the standard, such Java objects are not considered "native objects", but rather "host objects", as defined in section 4.3.8. This distinction allows certain semantical differences in handling them compared to native objects. For most purposes, Java objects behave just as native objects do: you can invoke their methods, get and set their properties. In most cases, though, you can't add arbitrary properties to them, nor can you remove existing properties. Native Java arrays and Lists support indexed access to their elements through the property accessors, and Maps support both property and element access through both dot and square-bracket property accessors, with the difference being that dot operator gives precedence to object properties (its fields and properties defined as getXxx and setXxx methods) while the square bracket operator gives precedence to map elements. Native Java arrays expose the length property. ECMAScript primitive types for number, string, and boolean are represented with Number, CharSequence, and Boolean objects. While the most often used number type is Double and the most often used string type is String, don't rely on it as various internal optimizations cause other subclasses of Number and internal implementations of CharSequence to be used. As a special extension when invoking Java methods, ECMAScript function objects can be passed in place of an argument whose Java type is so-called "single abstract method" or "SAM" type. While this name usually covers single-method interfaces, Nashorn is a bit more versatile, and it recognizes a type as a SAM type if all its abstract methods are overloads of the same name, and it is either an interface, or it is an abstract class with a no-arg constructor. The type itself must be public, while the constructor and the methods can be either public or protected. If there are multiple abstract overloads of the same name, the single function will serve as the shared implementation for all of them, and additionally it will also override any non-abstract methods of the same name. This is done to be consistent with the fact that ECMAScript does not have the concept of overloaded methods. Nashorn exposes a non-standard global object named Java that is the primary API entry point into Java platform-specific functionality. You can use it to create instances of Java classes, convert from Java arrays to native arrays and back, and so on. This package provides the javax.script integration, which is the preferred way to use Nashorn. Nashorn parser API provides interfaces to represent ECMAScript source code as abstract syntax trees (AST) and Parser to parse ECMAScript source scripts.